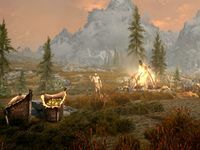 Bleakwind Basin is a giant camp located a short distance west of Whiterun. The camp is home to two giants and three mammoths. It is located west of Whiterun and north of the Western Watchtower. 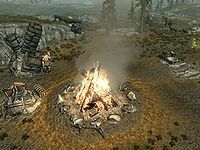 The camp is centered around a large campfire with two charred skeevers cooking on stakes. An expert level locked chest is southwest of the fire, with two mammoth cheese bowls beside it. Two more mammoth cheese bowls can be found to the north, with two patches of bleeding crown and a tree stump with a patch of mora tapinella growing nearby. To the northeast is a small pool with a nirnroot growing on the bank. Unlike most other giant camps, there are no bone chimes and very few painted rocks. Bleakwind Basin is in the origin cell (coordinates 0,0) in the Tamriel world space grid. Certain loading errors may result in players being dropped into this cell. This page was last modified on 7 January 2019, at 04:35.